Blogger integrated Google+ into their system to help you share your works easier and engage with your reader on a more attractive level. 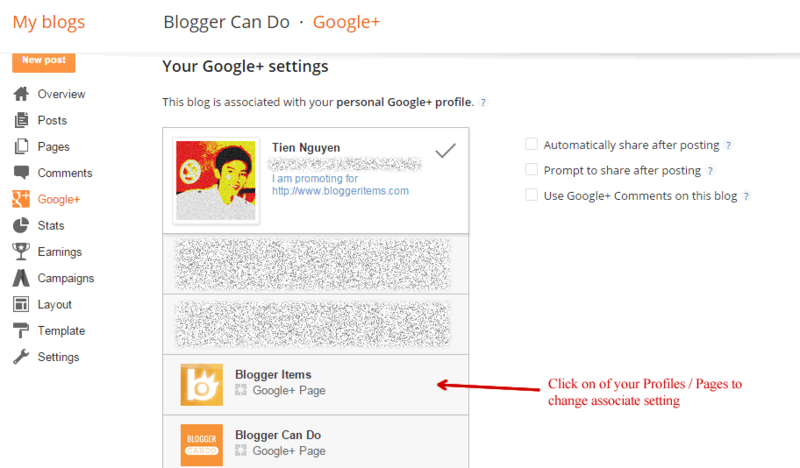 To access Google+ Settings in Blogger, Access Google+ Tab. And you will see your Google Profile and Pages on the left column and some sharing settings on right column. If your blog is under your common name, we recommend you associating your blog with your personal Google+ profile, and then you can share posts directly from Blogger to your personal stream. Just click on your profile avatar to associate your Google+ profile with Blogger. If your blog name is a brand, you can link your blog with a Google+ page, and then you can share your posts directly form Blogger to your page. Just click on a page avatar in the list to associate. 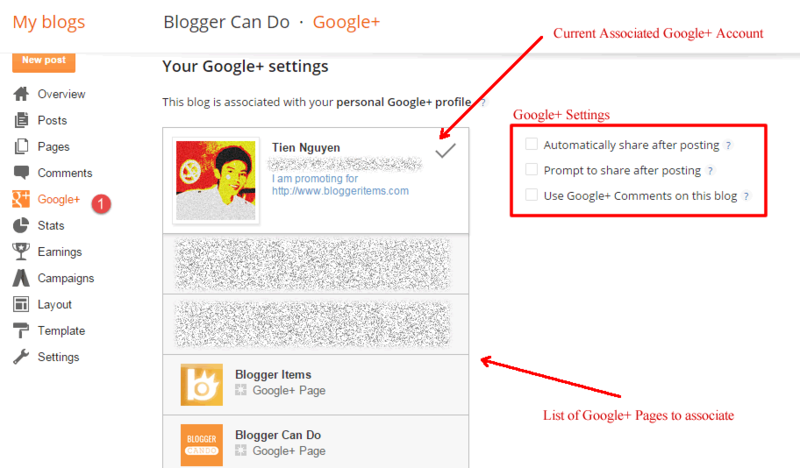 Your Google+ associate settings will affect all G+ widgets of Blogger. If you opt in “Automatically share after posting“, when you publish a post, Blogger will share to Google+ page / profile automatically. This automatic feature not work with scheduled posts. 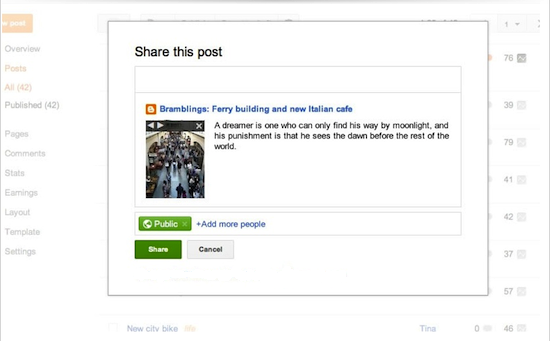 If you opt in “Prompt to share after posting“, Blogger will display Google+ share box after you publishing, and then you can decide that you want to share or not. We recommend you choose this, so you can control and modify the content that you will share to your readers/followers. 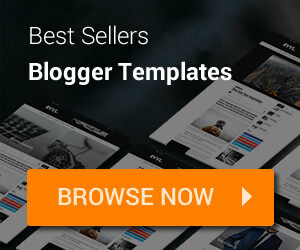 Blogger also allow you replace the default thread comment system with Google+ comment system. Notice: your readers need Google+ account to comment on your blog. And Google+ comments come with an iframe, instead of raw HTML like default Blogger comments, that’s not the best choice for SEO, but your post will have a chance to be shared when your readers choose to share their comment on their Google+ stream. 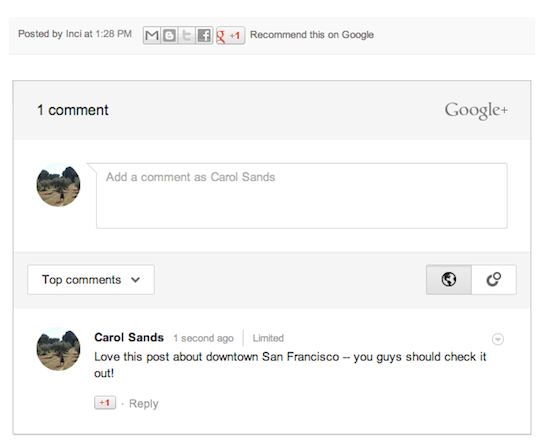 To use Google+ comment system, opt in “Use Google+ Comments on this blog” option. After that, check a post on your site and you will see Google+ Comment system appear under your post content (the position of Google+ Comment iframe depends on your template design).